Can you feel that the trend of "Chinese language craze" is overwhelming?See,this little boy from the United Kingdom was really infatuated with Chinese, in order to study Chinese better, he also took advantage of the summer holiday to participate in the Mandaringarden’s International Chinese Summer Camp, in the Chinese summer camp, he got along well with teachers, not only his Chinese had improved greatly, but also experienced the Chinese traditional art and culture. "Hello, my name is Jerry, nine years old. I live in London, England, and I'm studying Chinese." The little boy introduced himself in Chinese. In Mandaringarden’s international Chinese summer camp, the little boy got everyone's attention. And everyone was impressed by his fluent pronunciation, so, what is the cause of learning Chinese for Jerry? Let us into Jerry’s world and explore his story! Mr Hu,who is responsible for Mandaringarden’s international Chinese summer camp program,said that in the past year, Jerry suddenly had an idea, he wanted to write a letter to someone of every country in the world, and ask them what their life is like. In the next few months, Jerry wrote more than 200 letters, every country with one letter at least . Before he wrote a letter, he would refer the country and it’s people with his mother so that he can ask some questions related to them.when he wrote to Chinese, Jerry found that this is a very beautiful country, he wants to know more.Then,Jerry’s first letter to Chinese came to Shanghai, his pen pal replied with Chinese and English. Look at this Chinese letter, Jerry felt very magical, very curious, and fascinated by the Chinese culture deeply. 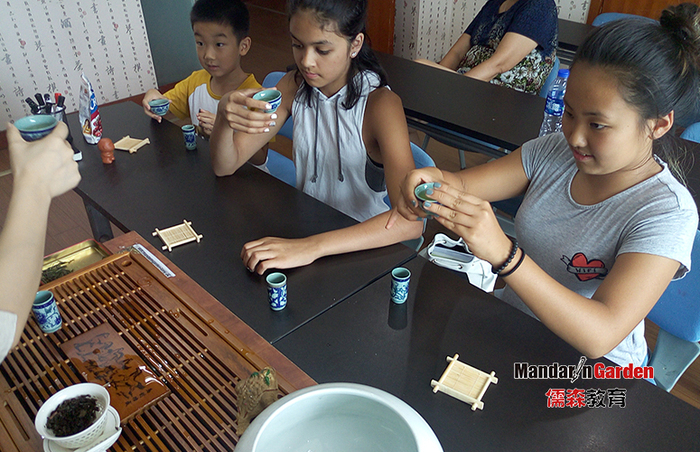 So in this summer,Jerry chose to participate in the international Chinese summer camp in Mandaringarden, and experience more about Chinese.Jerry loves here very much. He studied painting, paper cutting and calligraphy in this Chinese summer camp. He also learned to said "I love my mother" ,"I love my father" ,"my name is Jerry"etc. in Mandarin.Mr Hu said: "Jerry really loves Chinese, although the beginning is very difficult, and slowly, Jerry knew more and more." The little Jerry also hope to go to more places in China someday, he wanted to see more Chinese features,taste all the delicious food. 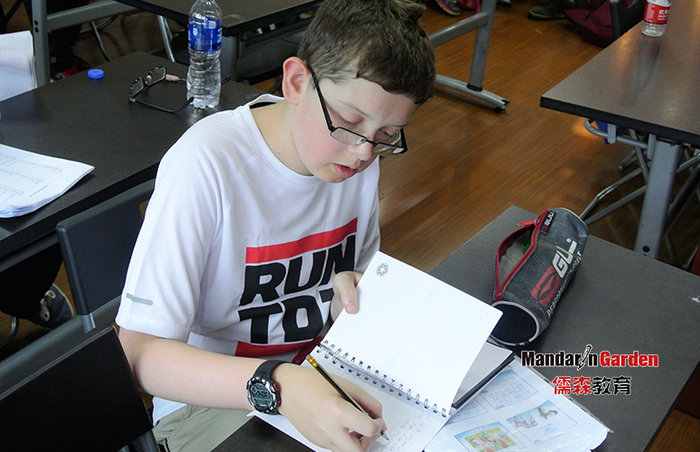 At the same time, he is happy to choose Mandaringarden’s Chinese summer camp, where he not only did learn Chinese, also made a lot of friends.Jerry hopes he can participate in the Chinese summer camp like this every summer. Next: Mr Zhao’s Chinese language learners from Italian, heat can not block their learning enthusiasm !